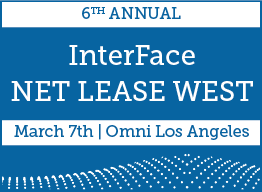 France Media's InterFace Conference Group is pleased to announce that the sixth annual InterFace Net Lease West, an information and networking conference for the net lease, sale leaseback and 1031 markets in the Western United States, will take place this afternoon of Tuesday, March 7th in Los Angeles at the Omni Los Angeles Hotel at California Plaza. Over 175+ attendees are expected at what will be the first major NNN conference of the year, and the biggest event on the West Coast. The event brings together leading West Coast dealmakers as well as national firms active in the Western United States and is produced by the same team behind the industry-leading InterFace Net Lease national conference held every September in New York City. The InterFace Net Lease West agenda will cover investment, development and financing trends and discuss market conditions in the NNN and sale leaseback space. The conference will also offer a retailer perspective panel presentation. The event will take place the afternoon of March 7th and conclude with a post-conference networking cocktail reception. 2017 promises to be another interesting and active year for the NNN space. Get a great head start on the new year and get informed and well-networked at the leading and most trusted information and networking NNN conference on the West Coast! To get timely market information and for high-level networking! 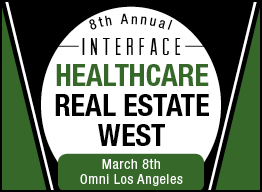 InterFace will also be holding two other events the same week as InterFace Net Lease West. 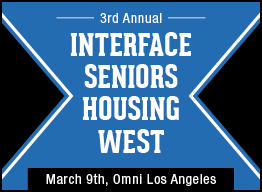 The 8th annual Healthcare Real Estate West will take place March 8th and the 3rd annual InterFace Seniors Housing West will take place March 9th. For more information go to www.interfaceconferencegroup.com.